Is committed to becoming a truly sustainable business. This means having the ability to continue providing our customers with high quality services in ways that enhance the environment. 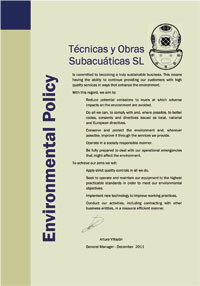 Reduce potential emissions to levels at which adverse impacts on the environment are avoided. Do all we can, to comply with and, where possible, to better codes, consents and directives issued as local, national and European directives. Conserve and protect the environment and, wherever possible, improve it through the services we provide. Operate in a socially responsible manner. Be fully prepared to deal with our operational emergencies that might affect the environment. Apply strict quality controls in all we do. Seek to operate and maintain our equipment to the highest practicable standards in order to meet our environmental objectives. Implement new technology to improve working practices. Conduct our activities, including contracting with other business entities, in a resource efficient manner.